Sweat dripping from forehead to chin, a loud stadium but a silent mind. A mind so clear with only one worry on it. It is time to win the game. The first set is up and the second one is coming. The lane is clear and this is the moment. The ball hits the floor hard after a powerful spike. Game over. The sound starts to turn back on and the roar of the crowd fills your mind. 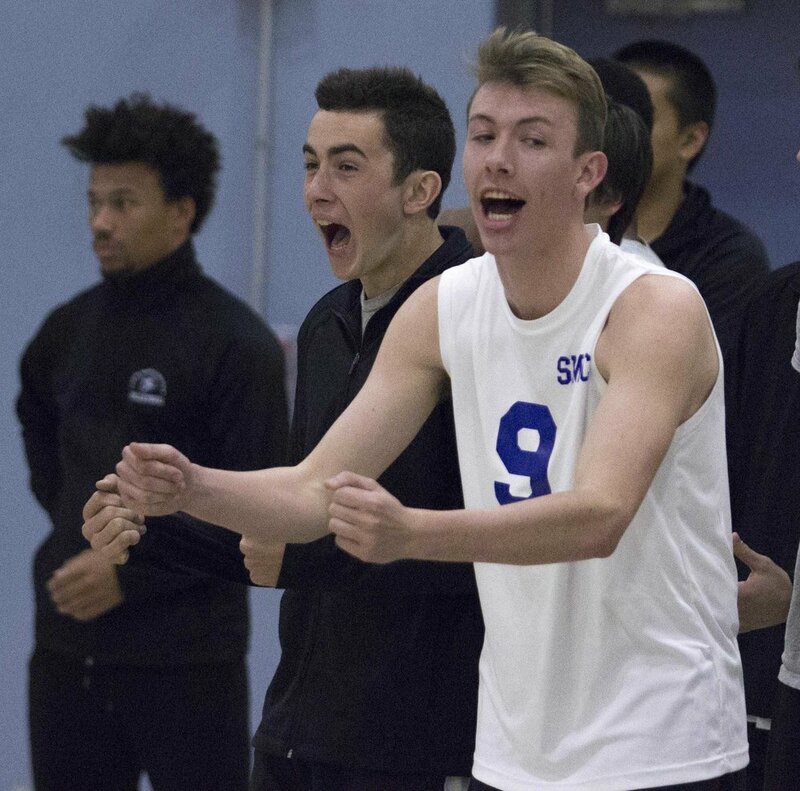 The Corsairs Men’s Volleyball team has had another impressive season under second-year head coach Jackson Meticchechia. Just two years ago the Corsairs were looking to defend their title but fell short in Meticchechia’s first year losing to Orange Coast College in the final four stage. This year they looked to bounce back and make another run at the championship. There were many new SMC freshman team faces this year but Meticchechia was ready to face the challenge. “My only expectations are that we play hard, be great competitors, and prepare well enough to put ourselves in a position to be successful,” Meticchechia said. The Corsairs started off the season hot by winning their first three games. Out of all nine sets, they would only lose two of them and it looked like they were going to dominate once again. The Corsairs would lose at the Irvine Classic Valley but would bounce back and begin an eight-game winning streak. They were looking unstoppable and championship talk was amongst everyone. Coaches and players understand the pivotal roles they need to play to win games and work well as a team. 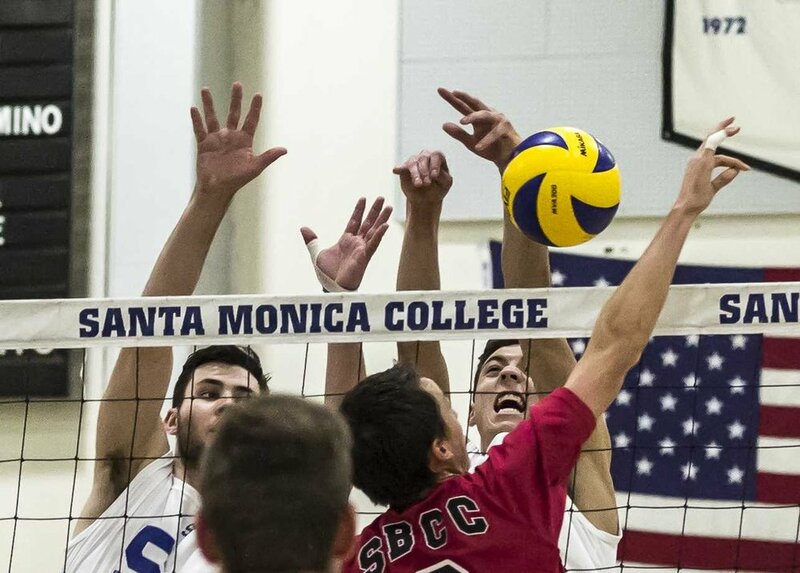 Santa Monica College Corsair freshman outside hitter Max Bell (7, right) spikes the ball as the Pierce College Brahmas freshman opposite hitter Brandon Oswald (1, left) attempts to block the ball in the SMC gymnasium at Santa Monica College in Santa Monica Calif., on Wednesday, March 1, 2017. The Corsairs were able to sweep the Brahmas 3-0 by the end of the game. “The players know exactly where they fit on the court, and what job they need to do to accomplish their goals," Meticchechia said. One of the things that the Corsairs feel like helps them is that they are a family, not just a team. They do not need to communicate as much on the court because through excessive practice they have learned to trust each other and understand the right plays. "You never expect a win, but the guys have had really good practices lately and I am confident in their abilities," Coach Meticchechia said. The Corsairs would recently pick up their second loss of the season against Long Beach but looked to bounce right back into the win column. The Corsairs are currently ranked in the top 10 poll for California Community College Men's Volleyball, and sit at 11-2 with six games left as they hope to end the season strong to make a championship run. This is the moment the Corsairs are after. The Corsairs play on Friday, March 24, 2017, at 6 p.m. against El Camino at home.